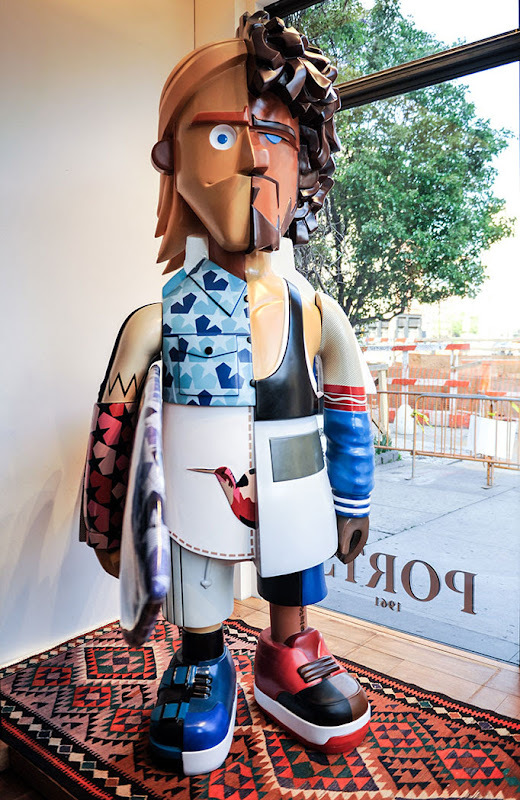 Ports 1961 and Creative Director Milan Vukmirovic, in an intimate event, unveiled the second toy in a series of three designed in collaboration with Hong Kong artist Michael Lau, at the New York City menswear flagship on May 19th 2016. With Michael Lau, the 'Godfather' of the designer toy movement, Ports 1961 released the first figure, the skater, in Hong Kong in May 2015. Vukmirovic's Spring-Summer 2016 collection has inspired Lau to create a 9-foot tall surfer figure for the second in the series, which features the key themes of the collection including the star camo print, #followme, and Navajo embroidery motifs. Following the unveiling, the sculpture installation will be on view through mid July 2016. The third and final figure in the series will be revealed in early 2017. Michael Lau is widely known for his designer toys inspired by street culture, hip-hop and skate culture. Effortlessly cool and masculine, Lau's work is well matched for the forward-thinking approach to menswear that Milan Vukmirovic has brought to Ports 1961. Milan Vukmirovic (right) with one of the guests at the event in NYC.